I must be honest before we came here to Israel, I used pecans very sparingly. They use to be so expensive in Asia and not very common to find. But they grow here, so not only are they in abundant but also affordable and the best in quality. I use them where ever and whenever I can. We even toss them in my stir-fry dishes and salads. I call that luxury. Yes! this has got to be my Rhea’s second favorite pie. She loves nuts and her first favorite is Macadamia. And I make a delicious macadamia tart that she LOVES! Loves it so much she doesn’t like to share it. If you like macadamia you absolutely must-try my macadamia tart. I tell you it’s the BEST! This pecan pie is an absolute luxury. 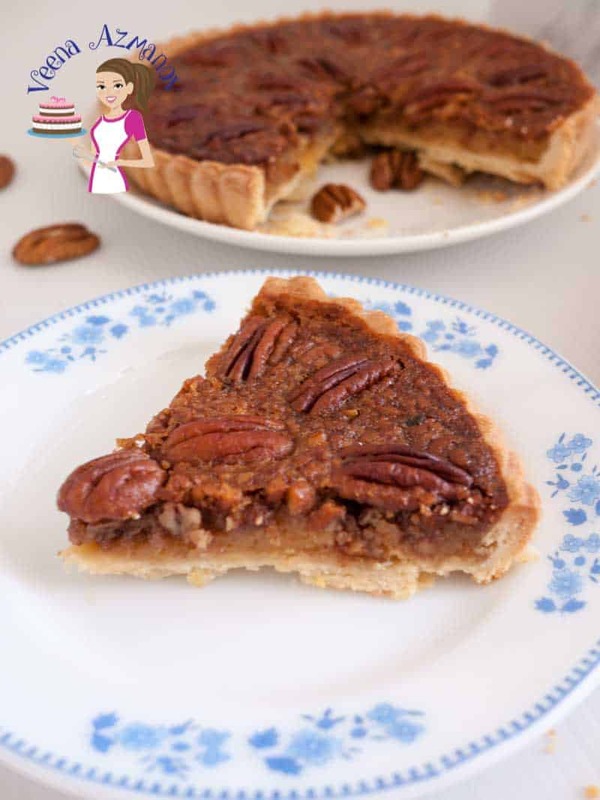 If you have been following me on this blog for a while then you know just how much I love pecan pie by the many pecan pie variation I’ve made. Like my Upside Down Pecan Pie Cake is an absolute treat, the Ultimate Pecan Pie Brownies is to die for, Pecan Pie Granola is like the best breakfast brunch you can ask for with a wonderful flavor of maple. And of course, the many other pecan desserts like the Chocolate Pecan Cake is an absolute luxury rich and delicious as it is flourless aka gluten-free, and if you love butterscotch you must try my Butterscotch Chocolate Pecan Squares, nothing beats a crumbly Chocolate Pecan cookies during the week, and Pecan Marzipan Truffles as Christmas treats. Told you I wasn’t kidding when I said I like pecans. 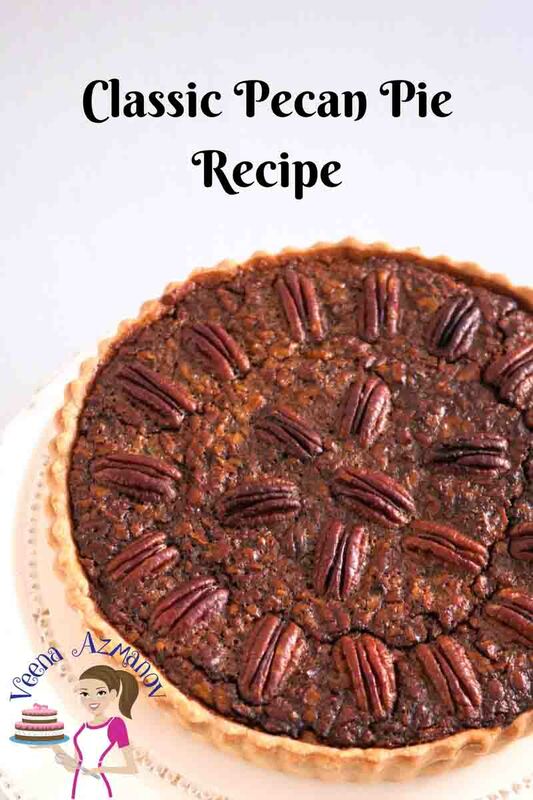 Now, this pecan pie I make every year for the full family for Christmas. I know in the US, this classic is usually associated with Thanksgiving. For me, Pecan Pie on Christmas is the tradition. I’m usually the one in charge of desserts in the family as you can tell being a cake decorator by profession. No one wants to bring dessert except – “tell Veena to bring cake! I’m not complaining. Actually, Golden syrup is simple caramelized sugar syrup often referred to as invert sugar. It helps prevent crystallization in baked goods and desserts especially as they cool. I usually buy it from the store but I remember back home my mom had to make it herself since it wasn’t available. So if you can’t find it you can make it at home too. It’s usually made in two parts. If you want me to make a post let me know and I’ll add that to the list of basic recipes for the future. Cook on low until syrupy usually take about 40 to 50 minutes. Cool and use as directed in the recipe. 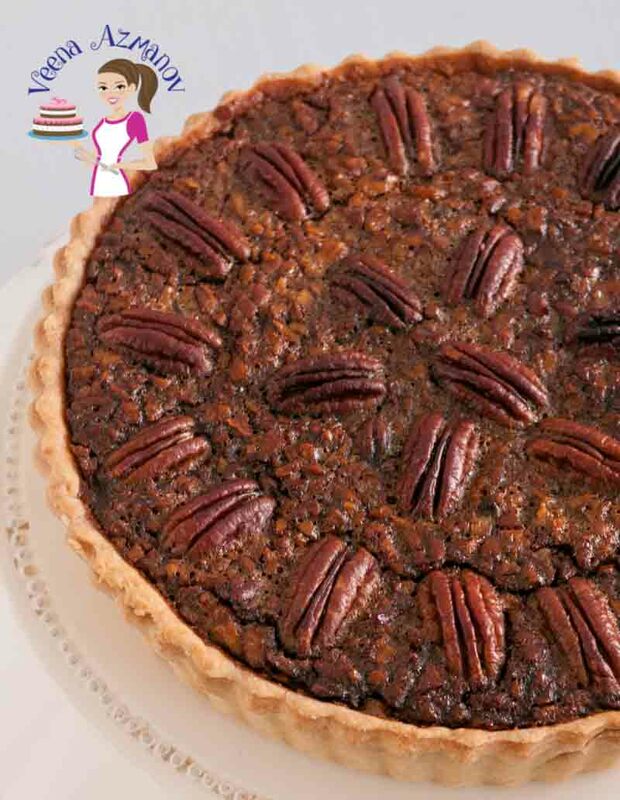 Pecans – Well it’s a pecan pie so – yes we need pecans. Having said that, you could make this with hazelnuts, or macadamia nuts too. Golden Syrup – I like the golden color and taste that golden syrup adds to this pie. I have tried corn syrup and while it works great as a recipe I still think golden syrup does the trick for me. So yes, if you must you can substitute with light corn syrup. Brown Sugar – I have used both on different occasions – light and dark. And while they both work great as a recipe. Personally, I like using the light brown sugar over the dark brown sugar. I think I much prefer the light taste of molasses instead of the dark. Cream – Yes, I know! You are surprised? I have cream in this recipe. I love making things more creamy and rich but in this case, I do think it does an amazing job. As you can see there is golden syrup and brown sugar so the pie is sweet and the cream just helps make that sweetness a bit softer. Can’t explain but you must try it and see for yourself. Lemon– Yes, yes, yes, we need lemon.. and no; you do not taste the lemon. The lemon just helps cut that sweetness. So, do not omit the lemon. You can use store-bought pastry for this of course but I hope you will try my homemade Pie Crust. As you can see in the video below it really is so simple and easy. If you love baking often and want to learn the art of making THE PERFECT PIE CRUST? 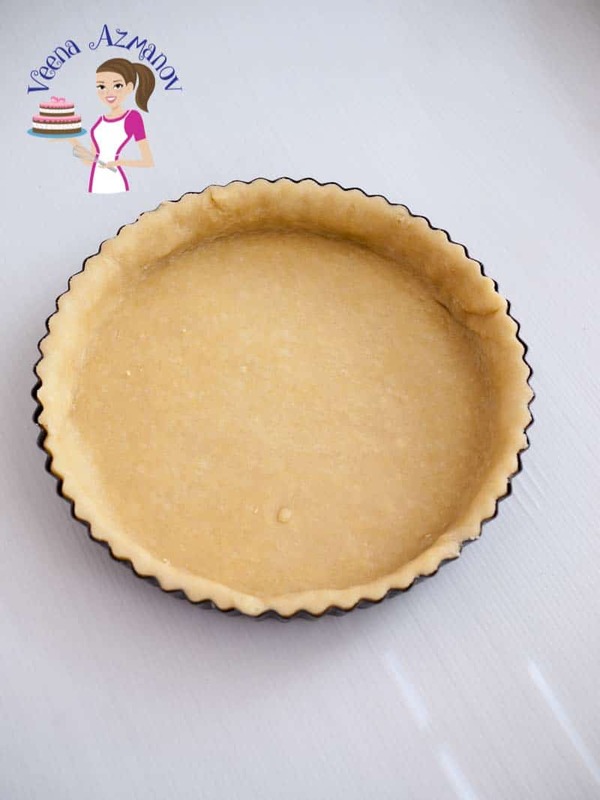 I have a post called Homemade Pie Crust Recipe – Pie Crust 101 with detailed instructions, and step by step to help you succeed. It also has a video so you can see just how simple and easy it is to make homemade pie crust. Ideally a pie should be made in a Pie Pan but I always use my 9-inch Tart Pan. I just love how beautiful this pie looks in a tart pan. A simple recipe like this does not need any major appliances. So, a simple mixing bowl and Whisk is a great start. A baking tray is absolutely necessary when baking pies and tarts and lining it with parchment paper makes for easy clean-up. You will need a chopping board and kitchen knife to chop the pecans. Chop the pecan small that way you will be able to cut pretty slices. 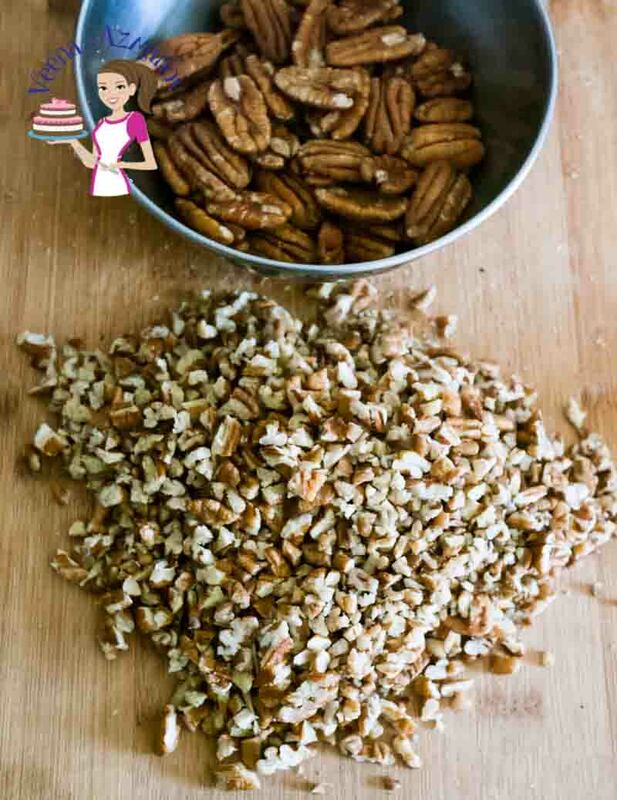 Leaving large pieces of pecans usually leads to a crumbly mess when cutting. In these progress pictures here – I have used Dark Brown sugar but don’t have the pie to show you lo. Sorry, it was gone before I took pictures. The video below shares food-processor method. Measure the flour, salt, and sugar in a metal bowl and leave in the fridge for an hour. Use fork or pastry blender to cut the butter into the flour. Wrap in cling or plastic wrap and chill for at least an hours. When chilled roll and drape a 9″ tart pan with the pastry. Prick the tart with the tings of a fork and pre-bake for 10 minutes in a preheated oven at 190 °C/ 380 °F. Let cool slightly while you make the filling. Reduce the oven temperature to 170 C/340 F.
Save some pecans for the top and chop the rest into small pieces. In a bowl and whisk combine – Brown sugar, melted butter, golden syrup, salt, vanilla, and lemon juice. Next add cream – stir to combine. 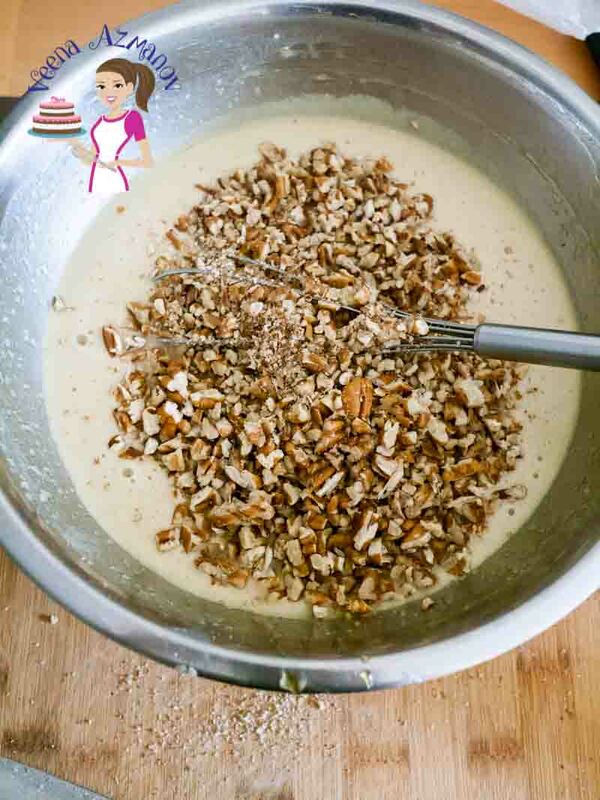 Pour the pecan mixture into the pre-baked pastry tart. Top the filling with the saved pecan halves arranging them to look pretty. Place in the oven on the middle rack and bake for 40 to 45 minutes at 170 C/340 F.
When baked you will see that the pie has slightly risen and is firm to touch. It will sink back as it cool. 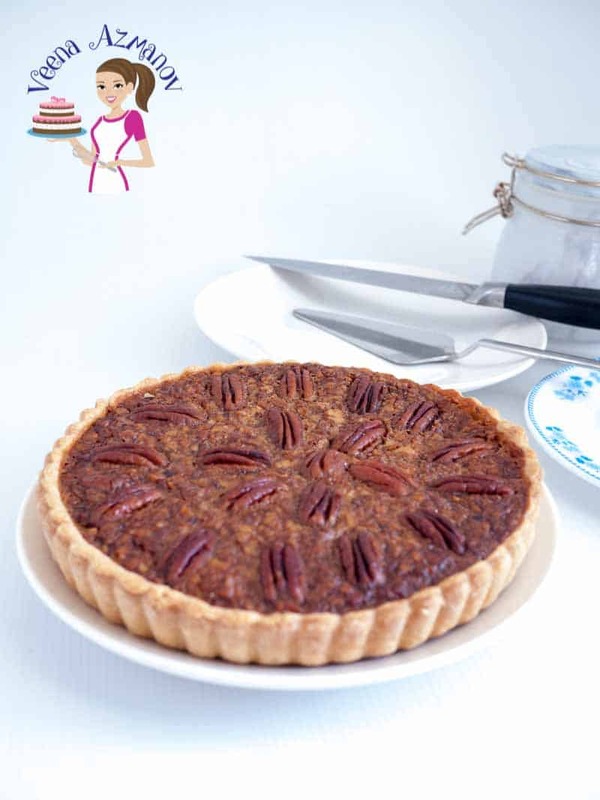 This is a delicious and beautiful classic Pecan Pie with an ever so little twist. Soften creamy filling made with golden syrup, brown sugar and whipping cream with toasted pecans then baked into a homemade flaky pie crust. The perfect classic dessert for your next festive dinner with family and friends on Thanksgiving or Christmas. .
Add the vanilla and about two tablespoons chilled water – more if needed to form a ball. When chilled roll and drape a 9" tart pan with the pastry. Reduce the oven temperature to 170 °C/ 340 °F. In a bowl and whisk combine - Brown sugar, melted butter, golden syrup, salt, vanilla, and lemon juice. Next add cream - stir to combine. 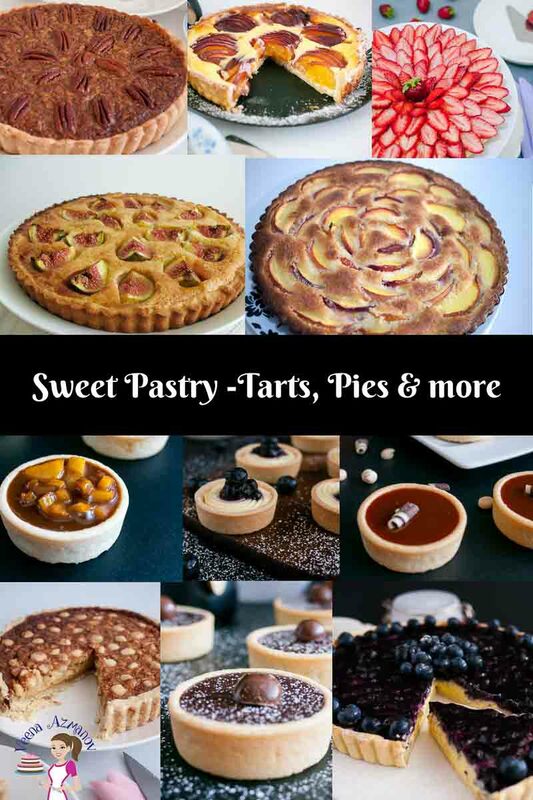 Take a look at some more options I have for you in Sweet Pies and Tarts. 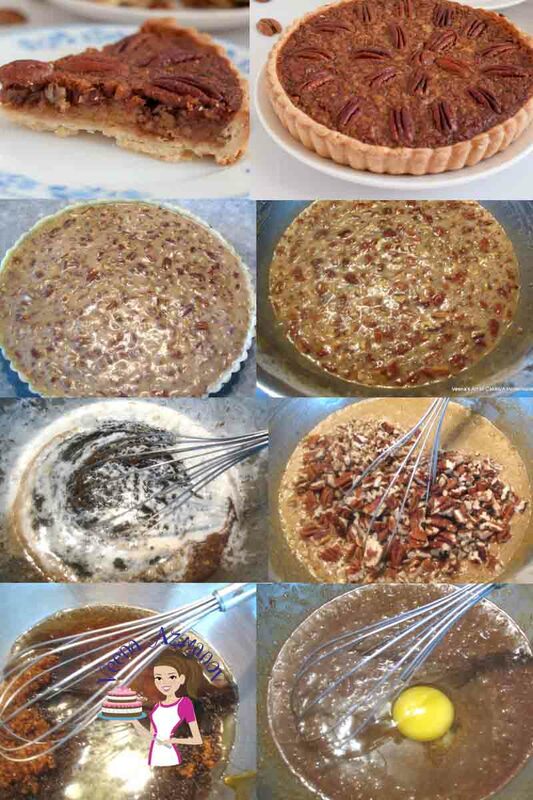 Here’s a list of my Sweet Pastry Recipes – Tart, Pies and more. 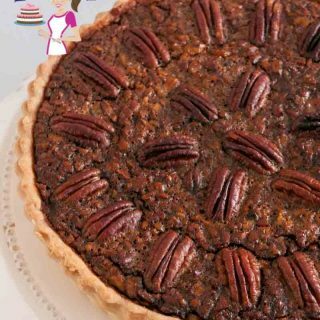 What a scrumptious pecan pie! Homemade pies for Thanksgiving and Christmas are a family tradition. Thank you for sharing your special recipe! Oh my gosh I need to try ASAP! 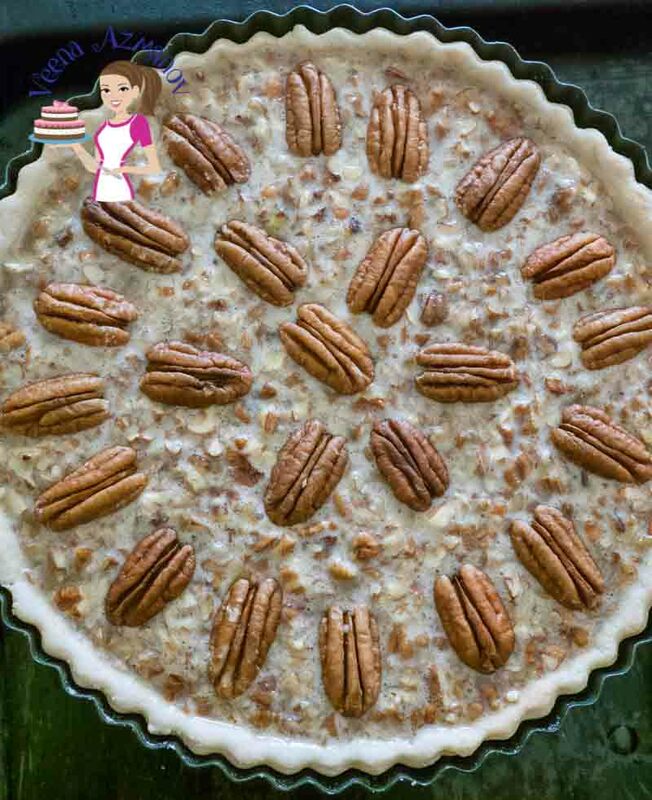 This pecan pie is calling my name! I’ve never had anything like this. Looks good! Thank you, Dan. I think you will enjoy these very much. This is my oldest son’s favorite pie. Unfortunately he won’t be with us for Thanksgiving. I may have to make it at Christmas. And I’d love to make a macadamia tart — but those nuts are super expensive here. In fact, pecans have gone up in price because the horrible storms last year demolished a lot of the pecan groves down South. Your pie, though, looks perfect. I’ll have to use your recipe for our upcoming pecan pie. Thank you, Marisa. Yes, pecans and macadamia are quite expensive here too but still affordable than when we were in Singapore. 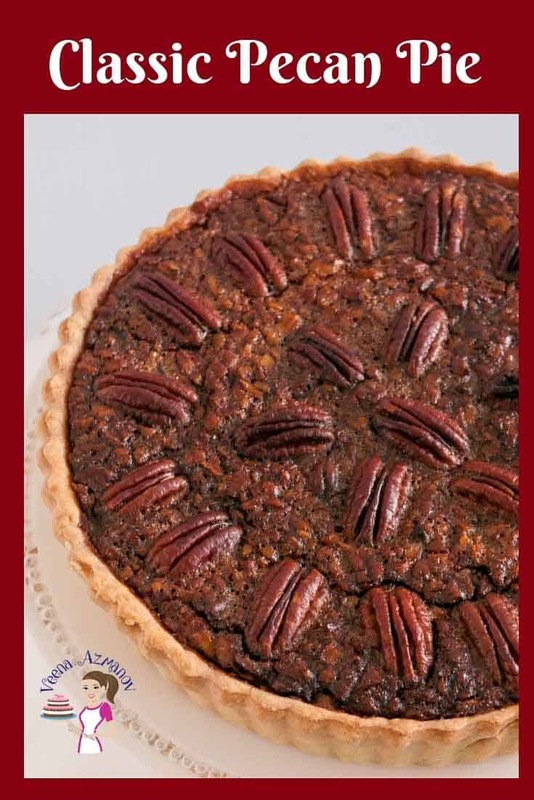 I cannot wait for pecan pie this holiday season. You are so right, it makes a perfect classic dessert for family and friends on Thanksgiving or Christmas. I’m not a fan of pecans…unless they’re in a mouthwatering pie 🙂 And golden syrup?? You’re speaking my language! I love pecans Karyl. This pecan is to die for. Your pie looks sooooo goooood! My husband will be delighted with this because this is a big weakness for him. I will be glad to try your recipe. Thank you for sharing. My husband too. Loves pecan pie. I hope you do Mahy. He will love it. Yes, I love toasting the nuts – really bring out the flavor well. Your pecan pie looks so good. 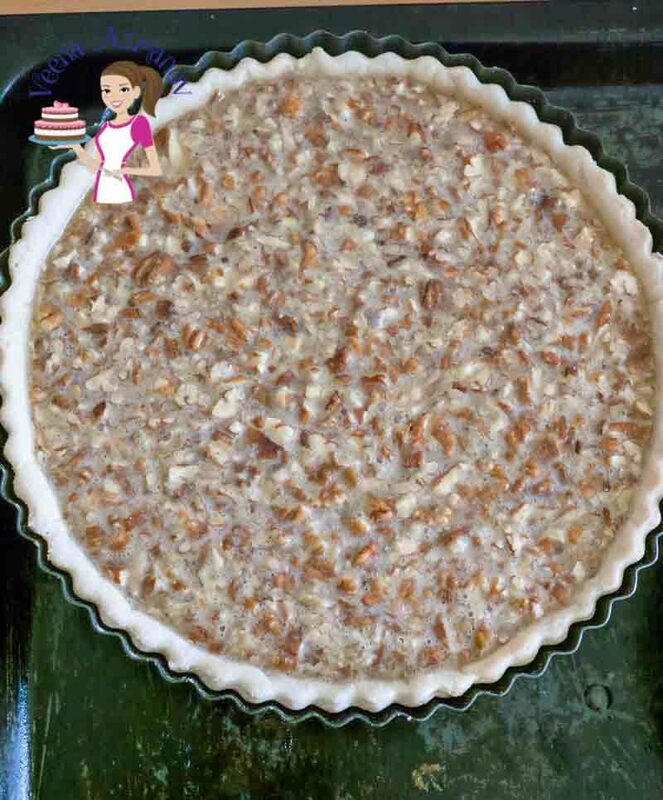 I haven’t made a homemade pecan pie in about 20 years since I lived in Georgia and could pick my own pecans. The golden syrup sounds so much better than using corn syrup. I can’t wait to try your recipe! Please tell me what golden syrup is? I can’t wait to try this! Golden syrup or light treacle is a thick, amber-coloured form of inverted sugar syrup made in the process of refining sugar cane or sugar beet juice into sugar, or by treatment of a sugar solution with acid. I will add a picture to the post..
Pecan pie is a weakness of mine, this looks perfect! Can’t wait to try it! yeah I know what you mean.. Ask my husband it’s a big weakness for him. OK…this classic dessert is always a hit. Here in Canada finding Golden Syrup is a challenge. My husband’s grandparents were from England…and he is very aware of this tasty syrup. I am always on the lookout…but not easy to find. I love Pecan Pie!! Your pie looks so beautiful! I love the topping and the use of golden syrup. So perfect for celebrations. Pecans are my absolute favorite, so I’m happy for you that now you have them in more abundance. Great use in this classic pie. And happy side note: I’ve been working on a tart recipe for the last 10 days, and the crust is just too wholesome in a not so appetizing way/ and now that I am reading this I realize that my ratio for the fat to flour is way off in the crust. Think I’ll click through and read your whole post about it Veena. Love how detailed and tasty this recipe is! Can’t wait to try!